"…And the Beast From the Sea"
In any good horror movie, real emotional elements have to balance out the scary ones. To care about the people running for their lives, it’s important to care about them as individuals and their relationships. Whether you hate them and want to see them die or love them and want to see them saved, horror is deeper and richer when emotions are in play. Hannibal is terrifying, yes, but it also has plenty of love in its darkness. (Some of it is just twisted, manipulative, dangerous love.) The terrific scene with Molly escaping the Red Dragon was one of the most suspenseful of the entire show, and Molly surviving mattered all the more because the show has highlighted Molly’s relationship with Will. It’s a safe place for him, and she is a good person. They can be relaxed and joke about their dogs. She is also wicked smart and keeps her head in an incredibly scary situation. It’s Molly’s quick thinking that saves her and Walter, and it was amazing to watch. Molly is the bravest, and I love her. And I can see why Will loves her. She isn’t just an easy escape, and his family isn’t just a band-aid to cover up the trauma in his life. He fits in with them, and he loves them, and Walter and Molly are whole, fully formed characters, even though they are fairly new to the show. 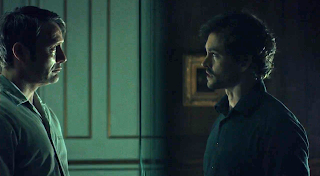 Their love is all the more tragic, of course, because it’s clear that Francis can’t get rid of the Red Dragon, especially when he’s got a friend like Hannibal. 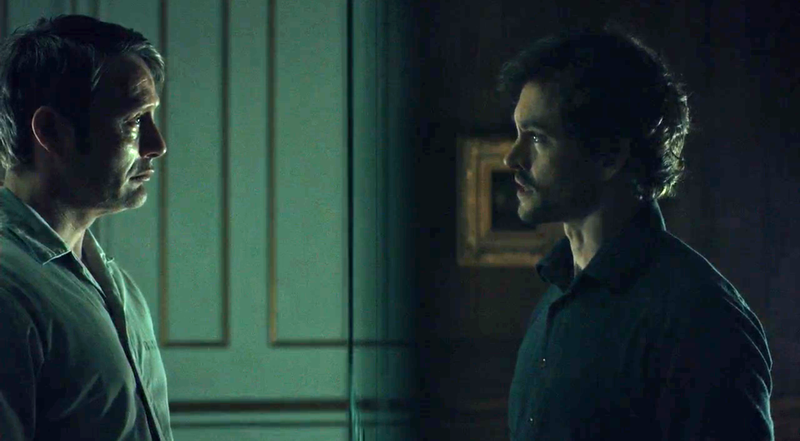 His interactions with Hannibal take the form of one of Hannibal’s therapy sessions, and the results are similar, too. With Hannibal’s advice — “save yourself, kill them all” — Francis sabotages his life and his relationship. He tells Reba he doesn’t know what to do or what is happening to him with her. She tenderly touches his face one last time to see if he is smiling or frowning, and he tells her he can’t be with her anymore because he’s afraid of hurting her. Reba is heartbroken, but to her credit, she doesn’t try to convince him to stay. She doesn’t want someone in her life who would hurt her, so she tells him it was nice to spend time with him, but he’s got to go. Coolest scenes: Will trapped in a window pane at the hospital, where I’m sure he feels like he is trapped in the world of Jack Crawford and Hannibal yet again; Molly and Francis standing directly above and below each other, separated by only the wood of their deck; Hannibal whispering bad ideas into Francis’ ear like the devil on Francis’ shoulder; Will and Hannibal facing each other, Hannibal covered in white, Will in black; Hannibal in the iconic straitjacket and mask. Will is looking good these days, am I right? His sweater and coat game is on point. Everyone is so surprised that Hannibal would just let people die, or that Jack would try to manipulate a murderer into killing himself. How long have you been dealing with these people? That’s their MO. Will we ever see Margot again?